Raccoons are wild animals, not pets, and even “tamed” are extremely high maintenance and require an experienced, knowledgeable guardian. 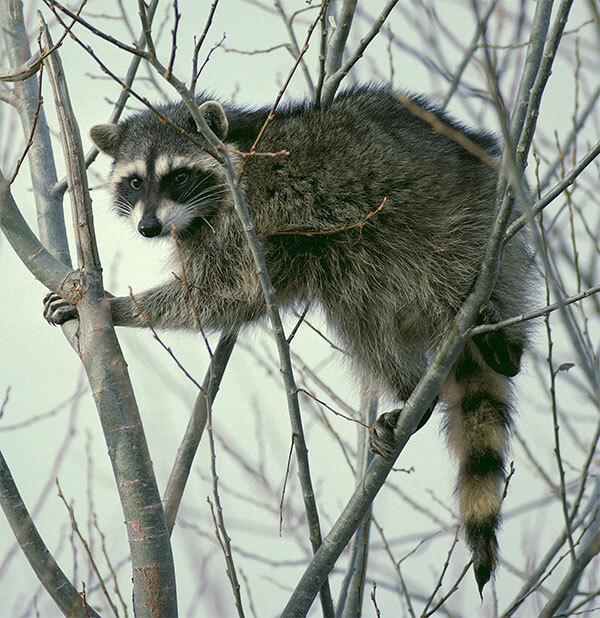 Raccoon Pest Control is important because raccoons can cause considerable damage to your house. They can destroy almost anything with their dexterous human-like hands. It is unsafe to allow raccoons to live in your home. Raccoon feces is very hazardous and should also be cleaned up when it’s found in the attic. Let’s face it, when nuisance raccoons tear up your property and leave trash or droppings around, it’s not a pretty site. Fortunately, with the help a trained professional, you can be sure to avoid a hassle with raccoon removal. 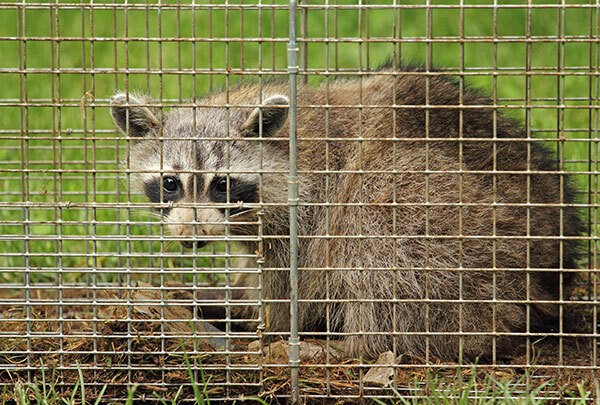 Although it may be easy to capture a raccoon in a live cage-trap on your own, there are many other factors of raccoon infestation that should be taken into consideration, such as; who is going to repair the damage, what to do with a caged raccoon, is attic cleanup necessary, and how can raccoons be prevented from getting into the attic long-term? These are all valid points as to why a homeowner should consider hiring a company before attempting raccoon removal on their own. Raccoon control is a risky business and requires professional guidance from a trained pro. Raccoons are nocturnal, which means they sleep during the day. They are excellent climbers. In natural settings, they like to find a spot high up in a tree to spend the day. If you’re going to ignore the info we gave above anyways, here are some tips for the DIY types of people who want to handle the raccoon problem on their own. Just remember, you didn’t hear this from us! Step 1: Buy a live-cage-trap. You can find these at Lowes & The Home Depot. Make sure to get the larger traps. Set the trap up on the ground & bait with marshmallows. Check the trap every morning for a capture. Step 2: Once you capture the raccoon, you have to dispose of it. Don’t drive the raccoon 3 miles down the road and cut it loose, it’s just going to come back anyways. Relocation is bad, as we explain below. You will have to find a safe way to euthanize the raccoon yourself. Or call a company to pick it up. Step 3: Once the raccoon has been disposed of, consider fixing the holes in your roof. If the raccoon was not in your home, then you are all set! 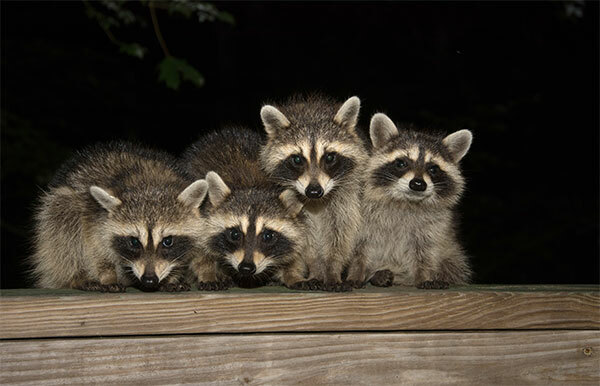 But if you need help repairing the damage raccoons caused to your home, our directory of pros can help with that too. Browse our directory to find a pro near you. Relocation is not a humane way of removing raccoons from the property. It is possible that a raccoon moved too far away from its home range can spread disease to other animals, according to the Washington Department of Fish & Wildlife. Raccoons that are relocated will spread disease to animal populations in the areas they are set loose, and so people should understand why it’s not a humane or ethical thing to do. While many people are concerned about the animals well-being, they should also consider what the realistic options are. Either the animal be trapped and removed, or live-exclusion can be done. All raccoon removal companies listed in our Pest Wildlife Directory will have the professionalism to treat any trapped animals humanely. Any way you slice it, solving raccoon problems is complicated and hazardous, which is why any homeowner with raccoons in their attic should consider the health risks associated with raccoon problems, and not to mention the damage being caused to their home. Don’t deal with raccoons any longer than you have to. Forget live-exclusion and go with trapping. Your home and wallet will thank you! What Is Live-Exclusion For Raccoons? Live-Exclusion is the process of evicting raccoons through 1-way cage doors, the concept being the raccoons will leave the house and not return. Live-exclusion of raccoons is difficult and nearly impossible, simply because raccoons are very persistent. Not to mention, the companies that offer this service are very limited in number, because the method is simply not effective. A person would be more likely to have raccoon problems in the future when any method besides trapping & removal is used. Raccoon infestation is not a pleasant experience, any person with raccoons reeking havoc on their home or property will tell you. Humane trapping is the best measure to utilize. Live exclusion works for bats and other critters, but very rarely for raccoons. You will end up paying a company 10X the money for live-exclusion instead of simply trapping the raccoons. Repairing the damages raccoons cause is extremely important, otherwise there might be more raccoons that are able to get into your home in the future. Raccoon damage repair strategies will vary depending on the infestation, but generally speaking it will involve patching holes leading into the attic. Sheet metal & other material is used for raccoon damage repair. The goal is to keep raccoons & other animals out for good! No matter what, the material used for raccoon damage repair should be very durable, this will discourage raccoons from accessing that spot. However, as we have mentioned already raccoons are very difficult to keep out whenever they are trying to get into your attic, and so the animals simply must be trapped and removed from the property to ensure the problem is taken care of successfully. One of the reasons raccoons are so unsafe to have in the attic is because they carry many diseases and parasites. Raccoon round-worm perhaps carries the highest risk of disease contraction among the diseases that raccoons carry. According to the CDC, roundworms in the raccoons can infect people and other animals and can be very serious, even fatal in severe cases. Raccoon feces is what carries the roundworm parasite; inside the droppings are microscopic roundworm eggs that can be absorbed through skin upon contact. There are also many other diseases raccoons cause. You’ll know raccoon damage when you see it - from items being torn to feces on the floor or attic. You may even find raccoons in your chimney. Raccoons are nearly impossible to stop. They are smart, crafty, and do their damage in the nighttime. There are no truly effective products out there to keep raccoons out of your attic, and there’s absolutely no way to keep them out of your yard. The only surefire way to stop raccoon damages is to trap and remove the offending pests. A fact that has been mutually agreed upon between professionals in the wildlife control industry, is that raccoons can rip through almost anything, and they cannot be kept out of an attic. It doesn’t really matter what is put over a raccoons entry hole into the attic. If a raccoon wants inside, it’s going to find a way. When patching up raccoon damage, some materials are better to use than others, but overall raccoons cannot be kept out of an attic no matter what is used to patch holes. Even if the raccoon is not able to break through the repaired area, if it really wanted inside the attic it will simply find another spot to get through. It’s pointless, because raccoons are able rip a hole in the roof, after all. The target raccoons simply have to be trapped & removed for the problem to be resolved. Surprisingly, there is actually a preventative measure against raccoons that has always proven to have a positive effect. The purpose of this measure is keeping future raccoons from noticing your home. So here it is; getting rid of raccoon scent. Yep, that’s right! Raccoons are highly attracted to each others scent. Diminishing raccoon scent from the attic after the previous raccoons has been exterminated will greatly reduce the chances of having future raccoons breaking into your attic! Getting rid of raccoon scent can be achieved by having the attic rededicated & sanitized. If raccoons have been in the attic for a while, they will have gotten their fur all over the insulation, as well as shed droppings in their chosen bathroom areas. Clean the mess, sanitize, and you will have much better odds of being raccoon-free in the future! If a homeowners neglects to have this done, they will be 10X more likely to have raccoon problems down the road. Raccoons in the attic is the most common raccoon problem to have. While there may be health concerns of disease and parasites, the damage raccoons cause while living in the attic is considered the more expensive factor. The most typical damage caused by raccoons in the attic is burrowing insulation and scattering droppings everywhere. Raccoons also inflict a more hazardous damage by tearing through electric wiring, which causes a fire hazard. Raccoons can get through just about anything. This has been proven to be true when raccoons tear apart thick screen that was previously put over a chimney crown. Raccoons will live in a chimney for a variety of reasons. When a mother raccoon sees an uncapped chimney, she sees a perfect nursery. It’s a safe and sheltered place to give birth to and raise her young until they are able to get around on their own. The fireplace chimney is usually preferred because the horizontal "smoke shelf " is a convenient size to nestle with her kits, but she may also use the chimney venting a furnace. 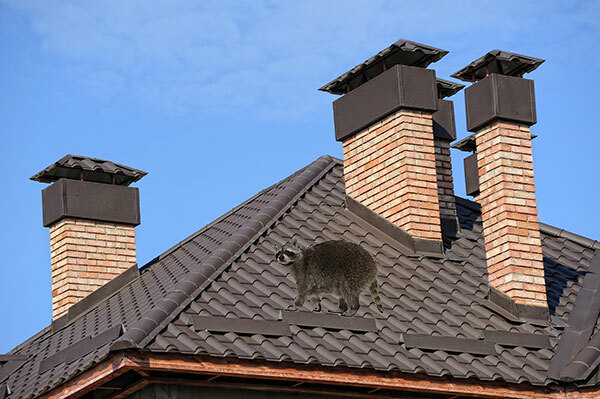 Professional raccoon removal companies will utilize a specially made chimney-trap to capture raccoons in a chimney. Raccoons can also be smoked out by starting a small fire, then caught with a snare pole at the top. After the raccoons are gone, a galvanized steel chimney cap should be installed to keep raccoons out long-term.